Constipation is unpleasant and can be harmful. Col-Max is a natural solution that really does work. Don’t let it ruin your day any more. Persistent or occasional constipation can now be a thing of the past. 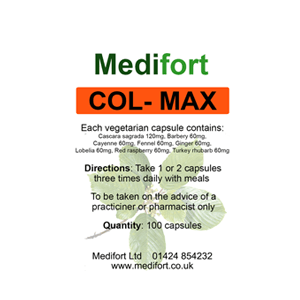 The unique herbal formula of Col-Max works in a completely natural way to help bowel elimination. No more stomach cramps or sudden urges that conventional laxatives give – Col-Max will help your body maintain a natural rhythm and help improve the muscle tone of your colon. Up to 6 capsules can be taken daily (2 with each meal) letting you fine tune the dosage to suit your body and needs. We recommend taking Col-Max on a daily basis once you have achieved the natural rhythm that suits you to avoid the condition returning. We have been selling Col-Max for over ten years and it is proving to be an absolute life saver for some of our customers. We have had amazing feedback from IBS sufferers who now use Col-Max and say their lives have literally been transformed. I cannot praise Colmax enough as it has been an absolute life saver for me. I used to go many days without going to the loo and would suffer terribly with any of the many different laxatives I tried. This has completely transformed my life and I go regularly almost every day. Thank you! I tried this on the advice of a friend and am very happy I did. Finally something that works and doesn’t leave me with cramps when I take it. I have suffered from constipation since I had my first child and have tried so many different remedies but this is the first I can live with on a day to day basis. New order today. I couldn’t be without colmax. For someone who suffered from constipation for very many years and tried everything in the market this is the best remedy there is. I would strongly recommend this to anyone who suffers from constipation. Excellent product. Reordering now. Thank you. Without doubt the best laxative I have used. Thoroughly recommended. The only one I use now. Excellent.